I have never met Drew Barrymore, but I think of her a little protectively; she exudes such warmth and sweet vulnerability, in all of her screen roles, that you come to think of her as a friend. So I was a bit worried before seeing “Whip It,” her debut as a director — would it disappoint? Some actors (Clint Eastwood, George Clooney, Robert Redford) transition into directors quite nicely; others (Kevin Spacey’s “Beyond the Sea” comes to mind) find the switch less graceful. You’ll see my full review of “Whip It” tomorrow, but Barrymore rises to the occasion, with her trademark loopy charm intact. 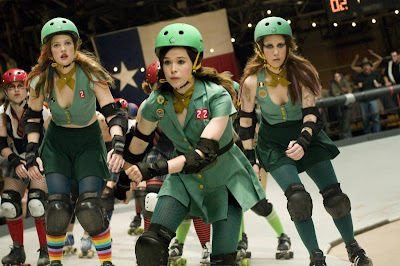 It’s a sweet girl-meets-roller-derby tale, not too ambitious but nicely handled, with an especially fine touch with her actors (particularly Ellen Page and Marcia Gay Harden, as daughter and mother). The girls are back: Drew Barrymore, Ellen Page and Kristin Wiig in “Whip It.” Photo by Darren Michaels, courtesy of Fox Searchlight.